August 3, 2013  Bhutan's Gross National Happiness index has gained currency at home and abroad since in recent years, but the new premier signals there are more pressing problems. 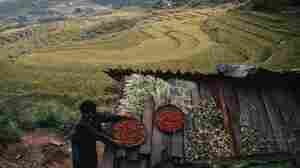 July 31, 2012  Bhutan wants to be the first country in the world to convert to a 100 percent agricultural system. Many farmers in Bhutan are already organic, which experts say should make the transition relatively easy. King Jigme Khesar Namgyal Wangchuck and Queen Jetsun Pema after their wedding earlier today (Oct. 13, 2011) in Punakha, Bhutan. October 13, 2011  In a simple ceremony, King Jigme Khesar Namgyal Wangchuck married "commoner bride" Jetsun Pema.